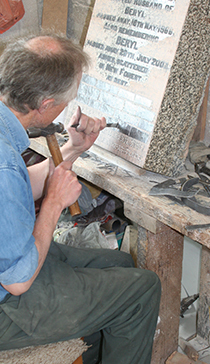 "All memorials are crafted to the highest standards by highly skilled and trained masons. Buy with confidence and peace of mind." Our services include; confirmation of all details in writing and scale drawings of the memorial with lettering designed by our highly skilled letter cutters (We have won awards for lettering design). 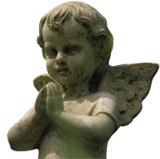 We have a wide choice of memorials for all budgets, starting from £340+VAT. From left to right, Gary Rochester, Shaun Lawless (both Bramm registered memorial fixers), Matt Withy (Stonemason), Sue Noyce (Accounts), Michael Williams (Retired), Robert and Karen Williams (Owners) and Nigel Axford (Stonemason and Works Manager).